Offset... One important thing to note here is the offset. The common 15x7 white rims are available in 2 offsets. 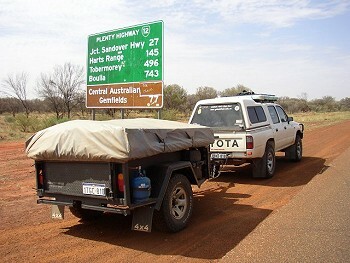 Mine were the narrower offset, often referred to as Navara, Jackaroo, or Pajero offset. 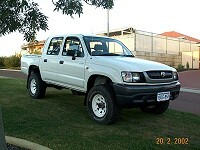 The wider offset rims, which are suitable for Landcruiser and Patrol, would have made the tyres hang out the side by nearly an inch, and so is not desirable without fitting flares. Also, going to a 15x8" rim would result in the same problem. I wanted to avoid fitting flares, due to the extra expense, and also the fear drilling holes in the side of my car to mount the flares, which could cause rust in the future. Brand... In this case, I already had the BF Goodrich (BFG) tyres, so there was no choice necessary. But, my choice of brand of tyre has been decided over many years of "testing" of other brands. I have run on previous cars a range of tyres including Bridgestone desert duelers, Yokahama super diggers, Dunlop Grad trek and Dunlop light truck, and many sets of BFG All terrains. There is no doubt that I have had a much better run from all of my BFG tyres. 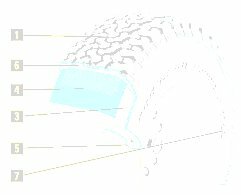 The number one advantage is puncture resistance, followed closely by better off-road traction (or as BFG put it, the T/A or Traction Advantage), and also their longevity. The only slight problem I have often noticed, is that as they start to age, they become more difficult to balance, sometimes giving wheel wobble even though they balance perfectly on a balancing machine, meaning that the tyre is beginning to wear unevenly or deform. Despite this, the tyres do not become any more prone to punctures or other problems, and live out their full life expectancy, which is often well over 100000k. Now, BFG tyres to cost a little more, but I firmly believe that you get what you pay for. BFG's have been a huge brand in USA for decades, and so are well proven and highly developed. 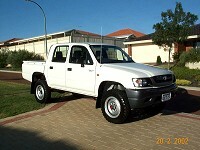 It's all about height... Now, before long I began to think about ways to improve the off-road performance of the Hilux. And the number 1 area that must be considered it tyres. So I decided to go for a taller tyre, but without increasing the rim offset nor width of the rubber, so that it would not go outside the guards. Now, the only way to do this on the 15x7 rims was to goto a rare size, being the 33x10.5R15 BFG (as opposed to the common 33x12.5R15 which is way too wide). But there is no doubt that the 33's would rub severely without major modifications, so I discounted that idea. The other option was to change the rims to 16x7's and fit 265/75R16, which would give me 32" and about the same width. So this is what I did. 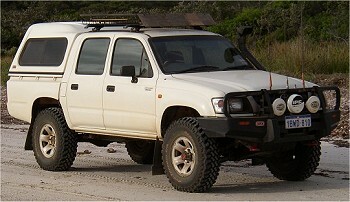 I bought 8 x 2nd hand Toyota Prado GXL rims, which are 16x7's and at the same offset. Mods needed for the 32's... Now, the 32's did scrape, turning full lock and going over even a small bump like a kerb. So, I did 2 things. Firstly I raised the front suspension by about 20mm by adjusting the torsion bars (about 6 turns of the bolt). This helped, but all you have to do is hit a bigger bump, pushing the wheel up the extra 20mm and you have the same problem. It scraped at the point where the front mud flaps mounted. So, I removed them, and got stuck into the metal with my angle grinder, taking about 15mm off the metal guard at the bottom, and also a bit off the seem. I then re-mounted the mud flaps about 50mm rear-wards, off custom brackets made from angle iron, which I bolted to the chassis where the body support brackets protrude. Problem solved. This page was last updated on 30 Oct 2005.